You might’ve noticed that kale, along with quinoa, sriracha, and sea salt caramel everything, is one of those trends that everyone seems to love these days. 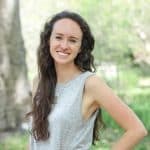 I’m pretty sure most of us, myself included, didn’t know what kale was until a few years ago, but now, all of the cool kids are eating it (or at least wearing it on their sweatshirts after Queen Bey started the KALE sweatshirt trend a couple of years ago with those YALE lookalike sweatshirts). Kale’s popular for good reason, as it’s been called one of the most nutritious foods on the planet and the “king of greens.” One cup of raw kale has 206% of your daily recommended Vitamin A, 684% of your needed Vitamin K, and 134% of your recommended daily Vitamin C, plus lots of other vitamins and minerals. Each cup also has 3 grams of protein and 2 grams of fiber, with just 33 calories (source). If you want to learn everything there is to know about this leafy green, check out this awesome article. With the kale I received in my mystery produce box, I decided to make kale & lentil soup and kale chips. First up: kale chips! I’ve heard people describe these as tasting just like potato chips and while I wouldn’t go that far, I think they ARE a delicious and super healthy snack! 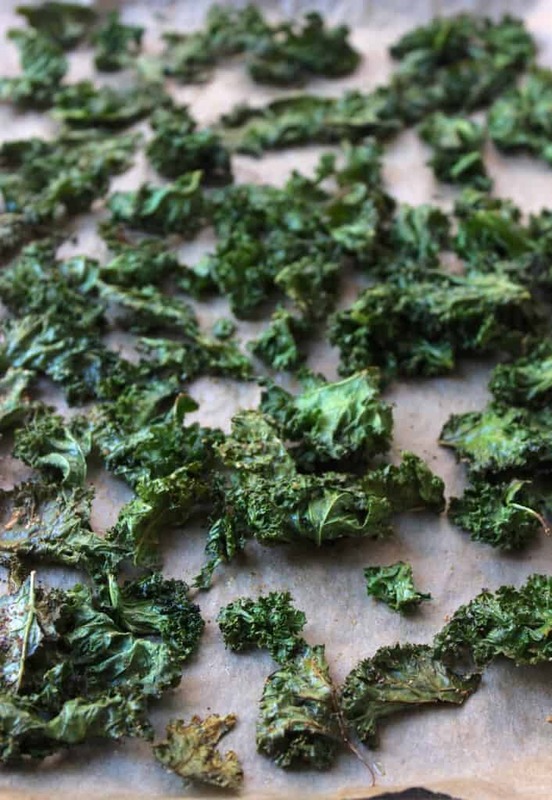 Plus, you can feel great about eating a giant bowl of these crispy kale chips. Be forewarned: you will feel like you’re eating crunchy leaves. Because you are. But they’re delicious crunchy leaves, nonetheless. 1. Wash and dry the kale leaves well. Water left on the leaves will “steam” them during baking and lead to soggy chips. I use a salad spinner to remove most of the water, and then I pat the leaves completely dry with a clean paper towel. 2. Remove the thick, woody stems in the center of the leaves because those stay tough even after baking. I grab the base of the stem with one hand and push along the stem to quickly and easily separate the leaves from the stem. 3. Spread the leaves into a single layer on the baking sheet for even baking. To achieve maximum crispiness, I try to resist the temptation to overcrowd the pan, even if it means using two baking sheets or baking two separate batches. 4. 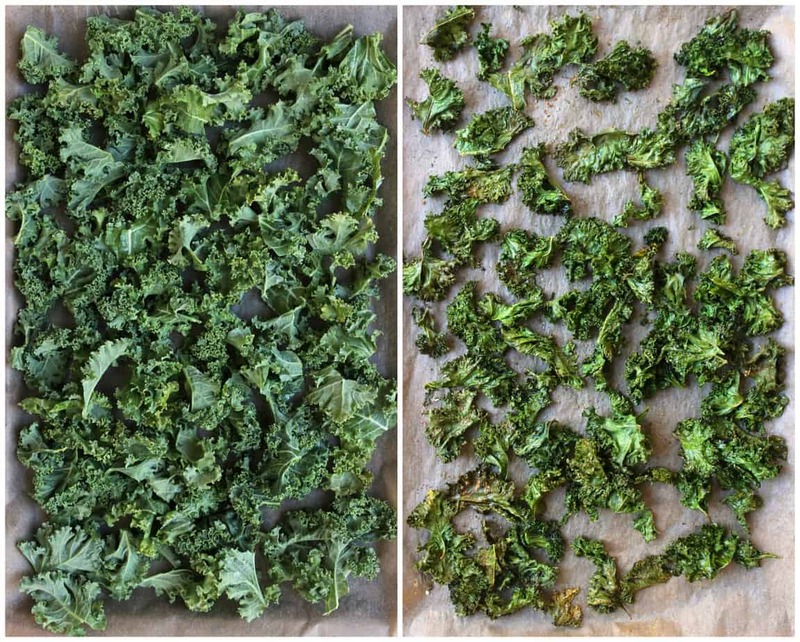 Watch the kale chips closely near the end of their baking time. Since they’re so thin, they can go from perfectly crispy to totally burnt within a couple of minutes. 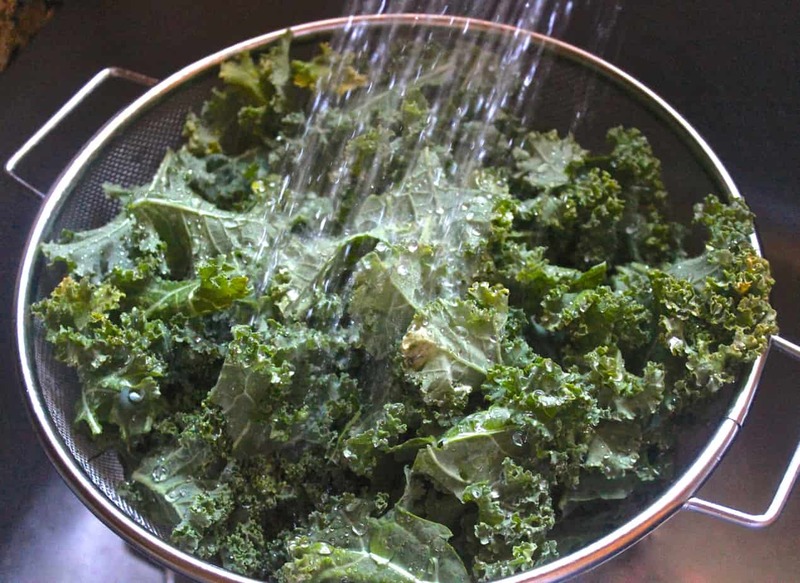 Wash and dry kale leaves thoroughly using a salad spinner or paper towels. Remove the thick, woody stem by grabbing the base of the stem with one hand and pushing along it to separate the leaves from the stem. Tear the kale into large pieces. Line a large baking sheet with parchment paper or a silicone baking mat. Add the kale and drizzle with oil. Sprinkle spices on top and toss thoroughly to coat. Bake at 300 degrees for 10 minutes, rotate the pan, and then bake for another 10-15 minutes or until the kale is crispy. Watch the chips during the last few minutes of baking to ensure that they do not burn. Let chips cool for at least 2-3 minutes before eating and serve within several hours of baking for best results. How do you like to use kale? I love kale chips! Thanks for the reminder to make them again! Yummy!!! 🙂 I need this, because it would be nice to know how to make really good Kale Chips! CRISPY IS DEFINITELY A favorite texture of mine! BRING IT KALE – BRING IT! Oh man do I love kale chips when they come out just right. Funny story – at our MPH graduation last week, they did a review of what was popular and in style in 2013 when we started the program, and kale was all the rage and at its prime. That got a laugh out of the nutrition crowd. Haha! I’m sure all of the health nuts loved that 🙂 Congratulations on graduating! I definitely want to give kale chips a try. I’ve roasted kale under chicken before and loved the crispness, so I’m sure I’d love this! Oh yum, your kale and chicken dish sounds delicious! Thanks for the tips! I love making kale chips but almost half of mine almost always come out soggy :/ Going to try making them your way! Hope this way works out for you, Liz! Ooh, I LOVE that idea, Julia! You’re a genius. I am not a fan of raw kale and spinach is actually my go-to green as I love its flavour and versatility. However, I don’t mind kale when it is cooked in dishes so I would be willing to give the Kale chips a try (especially if they come out as tasty as your pumpkin bread which was so good my mum had seconds!). I’ve been enjoying branching out into other greens, but spinach is my number one favorite, too, mostly because it’s so mild and versatile and I can easily slip it into salads, smoothies, soups, pasta dishes, etc. So glad to hear you enjoyed the pumpkin bread recipe 🙂 I won’t lie and say that the kale chips are as good as pumpkin bread…but they’re good in their own way! 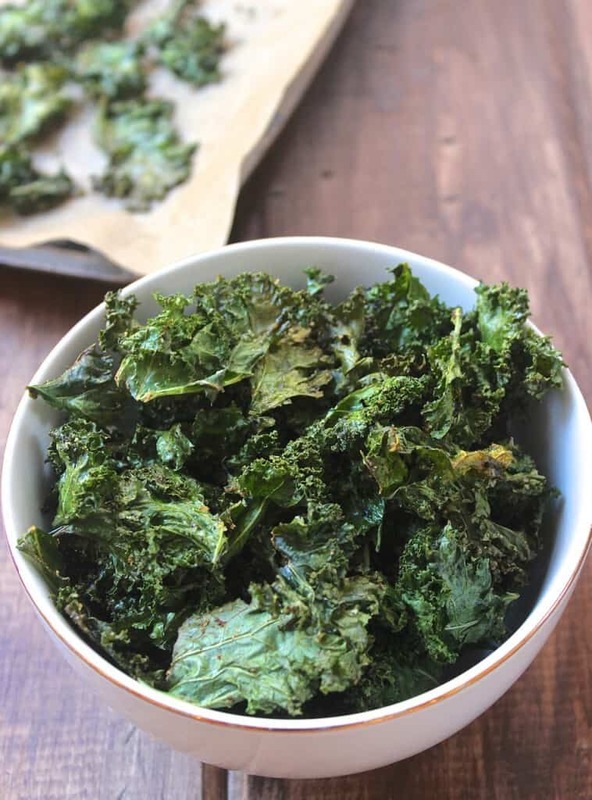 Kale chips really do taste a lot like crunchy leaves! I realize this sounds like a bad thing…but they’re addictive like potato chips because of the delicious spices! I LOVE roasting broccoli, too (especially with ghee!) and I think roasted broccoli beats kale chips. 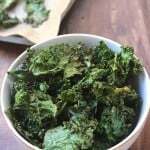 Kale chips do make a great little snack for when I’m in one of those snacky (but not super hungry) moods, or for a light side dish with a bigger meal! I could literally eat an entire batch of kale chips in one sitting. They are just too addicting! This recipe is flawless and the pictures are incredible love!! I agree 100%- storebought kale chips are super expensive and not nearly as good as the homemade ones!